Our Cold Brew starts with an artful blend of coffees from some of our favorite farms in Colombia and East Africa. These coffees are grown and roasted to be steeped long and cold for a super-smooth flavor. This is cold brew done the way we strive to do everything—patiently, diligently, following nature’s cues and letting time take its course. Try it as is—naturally sweet and unflavored—or with a splash of house-made vanilla sweet cream. 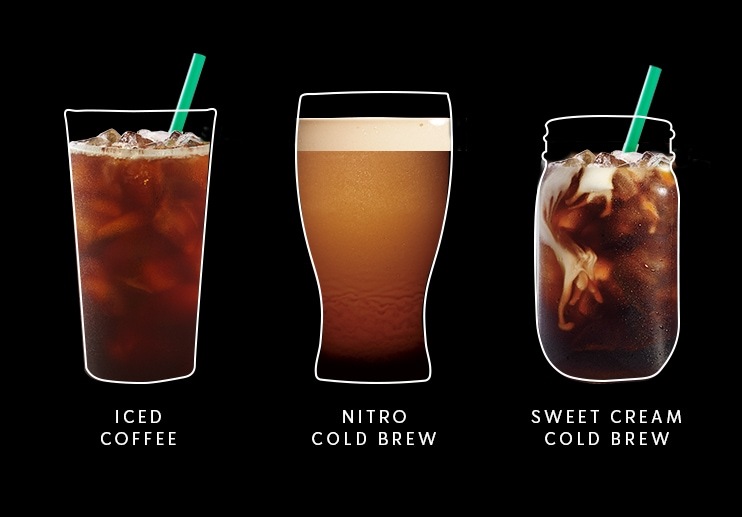 And for a craft brew, experience the nitrogen infusion of Starbucks® Draft Nitro Cold Brew. As our signature Cold Brew pours from the tap, microbubbles cascade to the top, creating a rich, velvety foam. For a classic cup, try Starbucks® Iced Coffee Blend, served chilled and lightly sweetened over ice. Find Nitro Cold Brew near you.